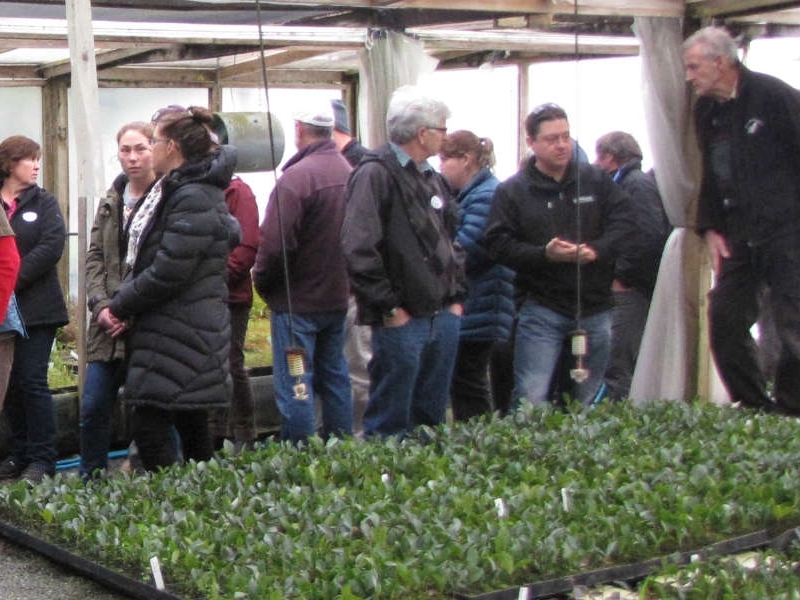 In August, around 50 IPPS members, partners and prospective members gathered in Tauranga for a field trip of local nurseries and attractions. Lindsey Hatch and Antony Toledo report on another successful IPPS field trip. An early start to the field trip saw all those present pile into vehicles and head off for the day. 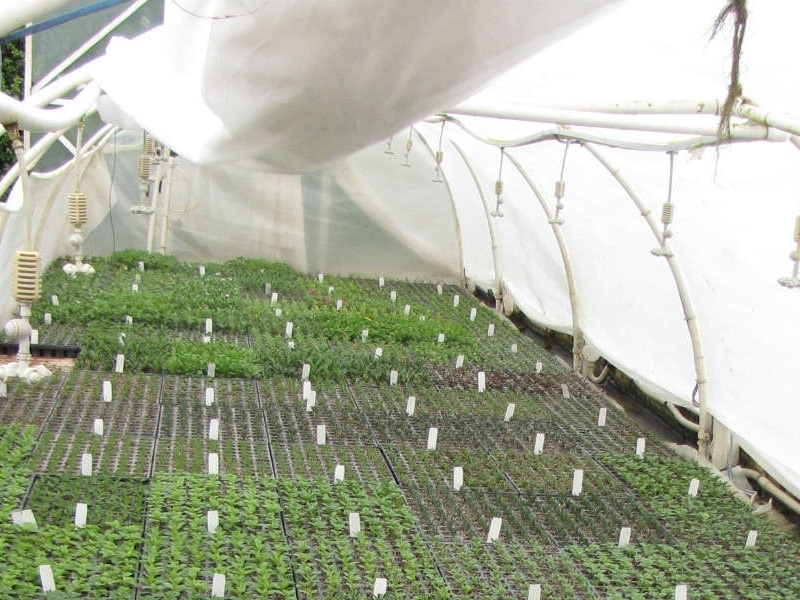 The first visit was to Forevergreen Seedlings Ltd run by Mike Riordan. 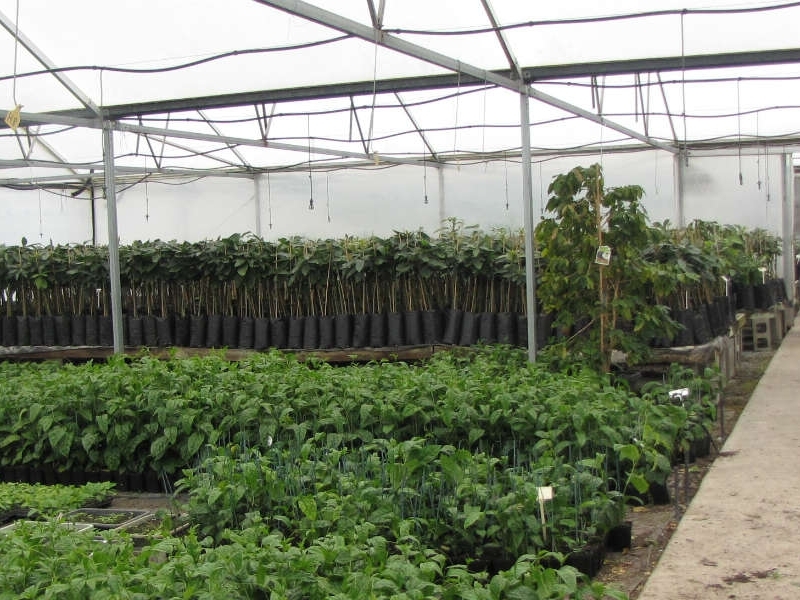 This is a small wholesale nursery producing liners of mainly native seedlings with a small range of exotics also and now producing Kiwifruit vines in his new certified growing unit as an approved certified Kiwifruit grower. After viewing the various areas of the propagation units including his seed germination room, we moved on to the kiwifruit unit where we had an interesting talk by Andrew Harrison and Karen Lowry about the Kiwifruit certification scheme and the wider kiwifruit industry. Andrew commented on the problems of PSA and other biosecurity issues not just those to do with kiwifruit, but horticulture in general this generated many questions and much discussion. With everyone’s questions answered, it was off to Colorworx Nursery Ltd, owned by Peter Arnesen where we were given a quick rundown of the property and its operations as we had morning tea. 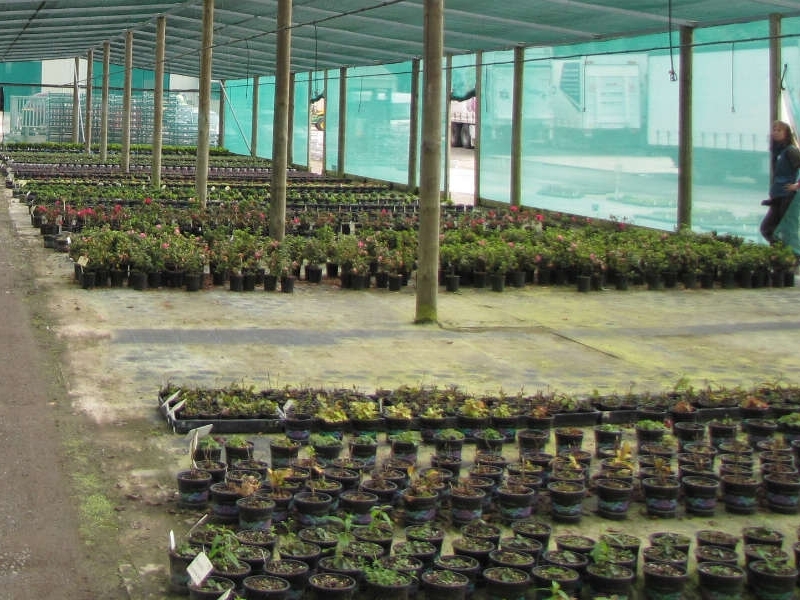 This is a well set out wholesale nursery producing mainly perennials and small shrubs for various box stores and garden centres. 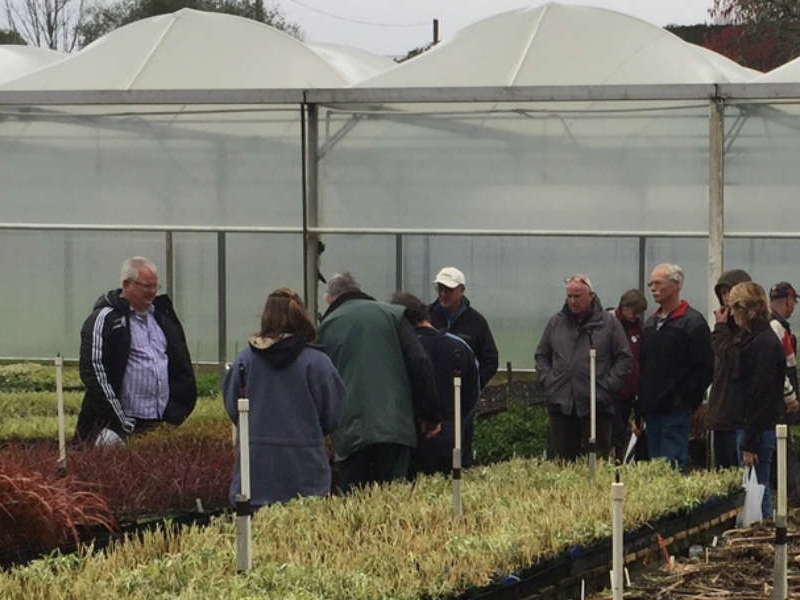 After morning tea we were all taken around the nursery by the head propagator Gill Bryant and the nursery manager Mike Rosenbrock and shown through the propagation units, the potting unit and the main holding nursery with plenty of information being shared as we went around. With thanks said to Peter and his staff, it was off to the next site. 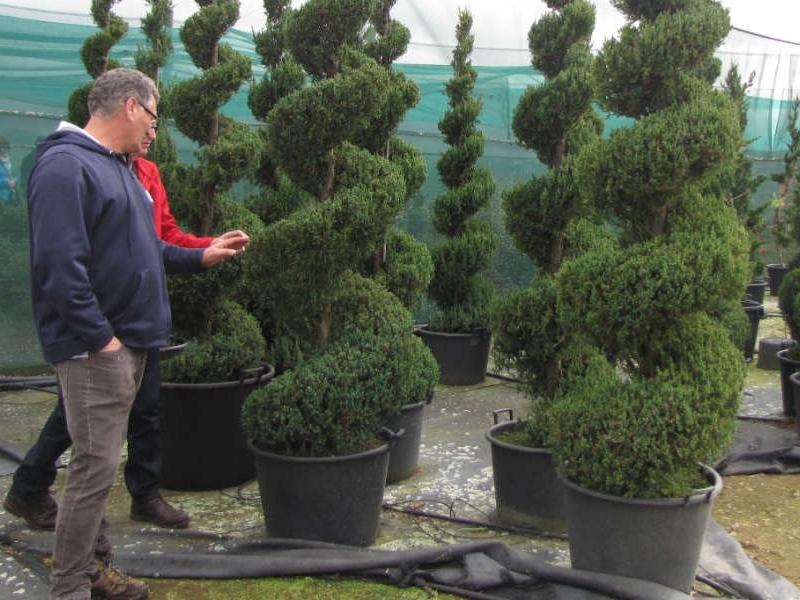 Standards of Excellence owner Claudia Gorringe informed us of her time setting up this small tidy topiary nursery that produces a range of specialized shapes and funky freestyle looks that can take several years before sale with a price to match due to the time these can take to create. Several types of conifer were used and various natives and exotics also, plants are shipped to clients all around the country and not sold through any outlets due to every piece being an individual and hand crafted - these cannot be mass produced. Then we were all off to the Fairview golf course for a nice sit down lunch and a room full of discussion. With lunch finished it was to Kings Seeds (NZ) Ltd owned by Gerard and Barbara Martin who supply seed to commercial and home gardeners around New Zealand. Gerard gave us a full rundown of the business and the logistics of running such a specialised company and the importation of seed, the packing and distribution of the seed to the many hundreds of customer’s home gardener, commercial growers and retailers around New Zealand. We were given a through guided tour around the well-oiled machine that is Kings Seed and its staff and systems. Many left most envious of this very well and tidy set up business and its nice new shed/office with everything having its place. The first visit on Saturday morning was to Copperfield Nurseries where there was intense interest in what Grant Tennet had to say about how his company produced the various citrus cultivars for the retail market. Our walk through his parent plant stock trees made us aware of the vast range of citrus bud wood Grant was able to cater for as demand required and if he did not have it on his property he knew where to find it at different locations around the country. 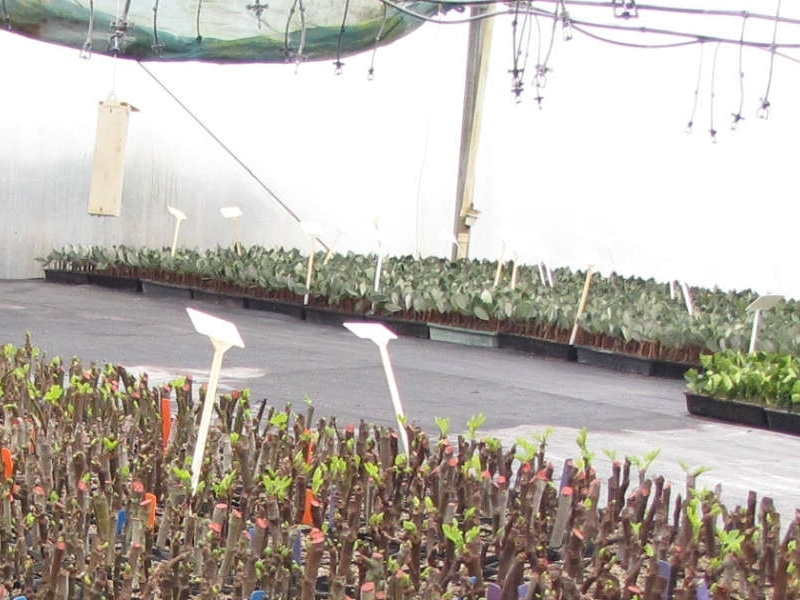 The rootstocks Grant uses were all produced from seed collected off his own stock plants, germinated and field grown until ready for lifting, then followed the replanting, to budding and lifting, then to the final potting on. A very much hands on approach to production which made the note books of some IPPS members fly open and good discussion was had over the pros and cons of different techniques. 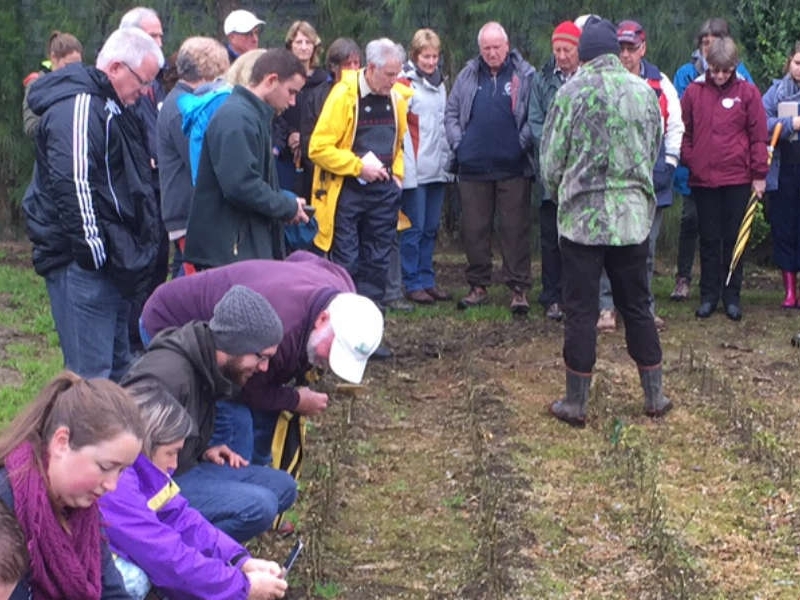 The group then visited the property of Maurice Sutton, a former dairy farmer from the Waikato had the foresight 20 years ago to plant a forest of 450 Kauri tree seedlings around his family home in Te Puna. 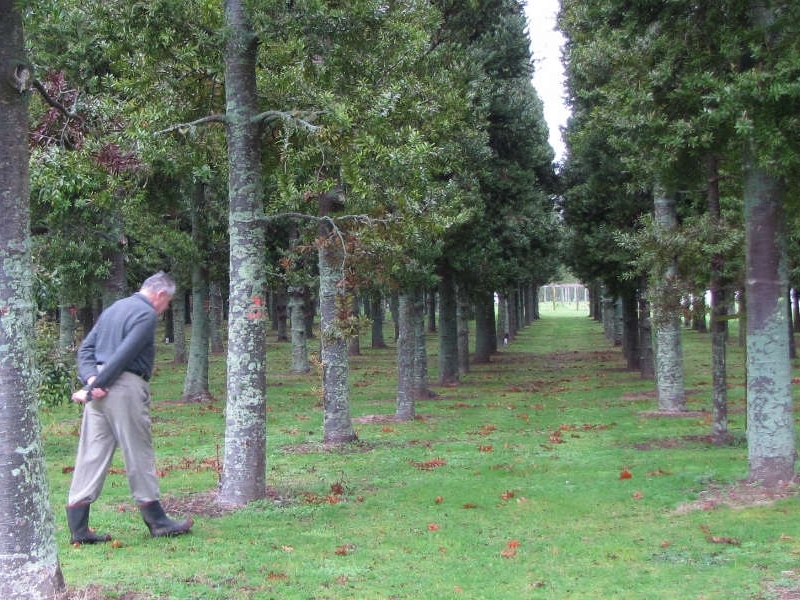 Now at over 90 years old, Maurice is still out in his “labour of love” block looking after the pruning and well-being of his trees, so much so he has attracted the attention of crown research facilities eager to monitor growth rates, form and wood quality. Strict hygiene protocols were adhered to by the IPPS group prior to walking through Maurice’s “Kauri Wood Lot”. After a visit to the inspiring Suttons Kauri Woodlot we moved up the road to Beechwood Plants and Plant Struck. This is the former site of Parva Plants and now operates as a plant outlet servicing in particular landscapers (Beechwood Plants) and Ian Duncalf’s breeding/selection growing on operation (Plant Struck). Cathy Schnider the owner of Beechwood Plants has her own nursery higher up in the Kaimais and uses this site as an outlet for her product and brought in plants particularly for landscapers but also home gardeners. They do both supply and provide plant advice using Cathy’s years of experience ably assisted by Ian Aitken another with great plant knowledge. Plant Struck concentrates on breeding and growing Clivias as well as producing proprietary lines of their plant selections as well as focusing on non-seeding varieties of Agapanthus. The anticipated “mystery tour” was well received by IPPS members and thanks to Ian Wilson, past Centennial Trust chairman and partner of the Kopurererua Valley Restoration Project, we gained considerable knowledge on the mammoth 20 year project to transform 300 hectares from rough farmland into a natural landscape and walkway. Heralded as the biggest restoration project in the Southern Hemisphere more than 300 000 trees and shrubs have been planted since 2005. 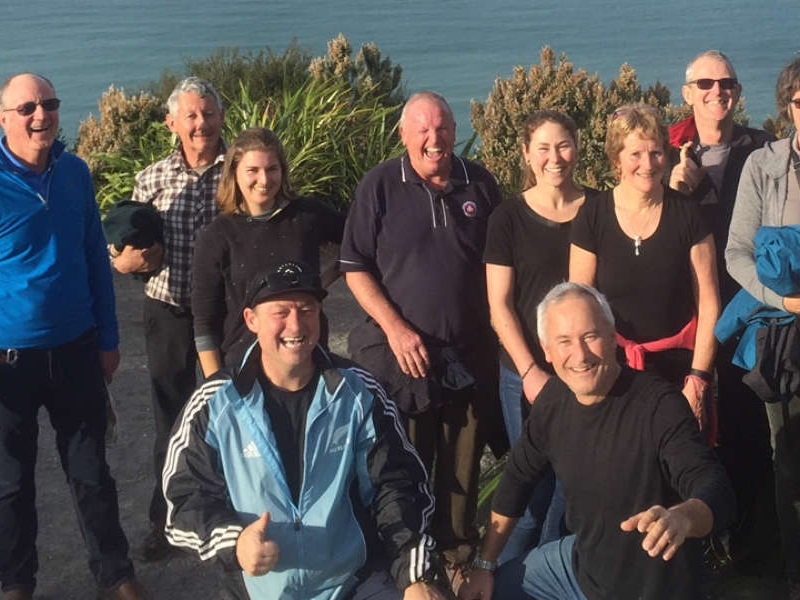 Ian Duncalf lead the tour and walk around The Mount and it was a fantastic way to unwind, get a bit of fitness in and work up an appetite. Those of us who were keen to get an elevated sea view headed for the summit.